In the tourism industry there are refurbs – and then there are REFURBS! And Garonga's recent 3-month makeover has on all accounts been more like a rebirth! As Garonga Safari Camp (near the Kruger in South Africa) enters its 20th year of operation it has undergone a complete transformation – keeping all the special touches and elements that make Garonga “Garonga” – but giving the whole experience a significant lift. Garonga Safari Camp in South Africa's Limpopo province has just reopened following a 3-month long makeover - giving it a fresh face - while maintaining that special "Garonga" feel to it and blending seamlessly with the surrounding bush, thanks to its new “wet elephant” green colour. Its six safari tents have new black shade nets over the current canvas rooves, brand new decks and new outdoor showers that have real “wow” factor! Small mini-bars have been added to the room, beautiful wooden headboards and a bathroom of note! Yoga mats are now in each room to give Guests a chance to spread their “majic”. The softs have all been updated and the rooms are proof that you can in fact, improve on perfection! The changes have not only been cosmetic – Owner Bernie has invested an incredible amount of time and resources into the human element or “soul” of the Garonga experience. While the refurb has been underway key staff members have enjoyed fantastic opportunities to build on their skills and experience under the mentorship of hospitality guru Tony Romer-Lee and have come back full of inspiration and enthusiasm after spending time gaining work experience in Cape Town at top establishments. Garonga's Head Chef, Reineth, spent some time working at the Taj Hotel Cape Town, Hogs Head Restaurant and Spier Hotel – whilst Robert, recently promoted to Manager of Little Garonga (previously Head Waiter) also gained experience at the Taj Hotel, The President, and Spier. Our whole dining experience has been overturned by Executive Chef Trainer, Lee-Ann, who will continue to come out 3 times a year to oversee the high standard of cuisine. The displays and presentation of food now looks even more incredible. All safari Guides have also been on an intensive year-long training programme to hone their tracking and guiding skills. They also have the latest guiding equipment ensuring guests will enjoy maximum comfort whilst out on game drives searching for Africa's Big 5 (Black Rhino were reintroduced into the reserve 2015, so now we have Black as well as White Rhinos). A new pack of Wild Dogs have also decided the Makalali Conservancy is “the place to be” in 2016 - which is great news! 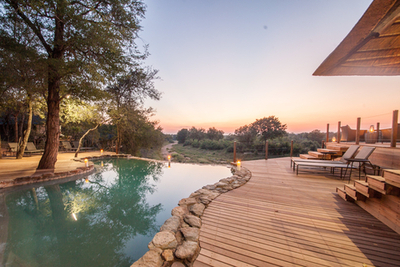 So the safari experience will be better than ever – to match the swish new lodge! Little Garonga, its sister camp nearby, has also had some interior changes made including a lovely big window added to the spare (Children's) bedroom of Hambleden Suite, giving additional light. Access to Garonga has never been easier with daily direct Federal Air flights into Garonga from Johannesburg's OR Tambo. Garonga also collects guests from both Phalaborwa and Hoedspruit airports. Short air hops from Kruger Mpumalanga airport are also available using Odie Air. On the “Green Front” Garonga has massively upgraded its Solar System, and heater pumps for the rooms, so now we are in the forefront of “Eco-Friendly Lodges in South Africa”. To remind you what we already have - a Water Filtration plant to renew “Grey water” to drinkable water for the animals which avoids having to use Fresh water from the Borehole, the heater pumps that save 60% of power usage, our own bottled water plant that removes the use of plastic water bottles, and our Veggie Garden. For more information, visit garonga.com.